Axis zoom — Right-click and drag in any axis to zoom in on that range. Right-click on the axis without dragging to zoom to fit all data along that axis. Rubber-band zoom — Hold down the right mouse button and drag in the display area to zoom into the selected area. Scroll zoom — When zooming, it will focus on the location of the mouse pointer (i.e. the trace at the cursor location remains stationary). When zooming out, it will stop automatically when the data is entirely visible. Scroll the mouse wheel up to zoom in or down to zoom out. Scroll the mouse wheel on the horizontal or vertical axis to zoom in and out of a single axis. Zoom to fit — Right-click in a view and select Zoom to fit to fit the entire dataset in the display area. 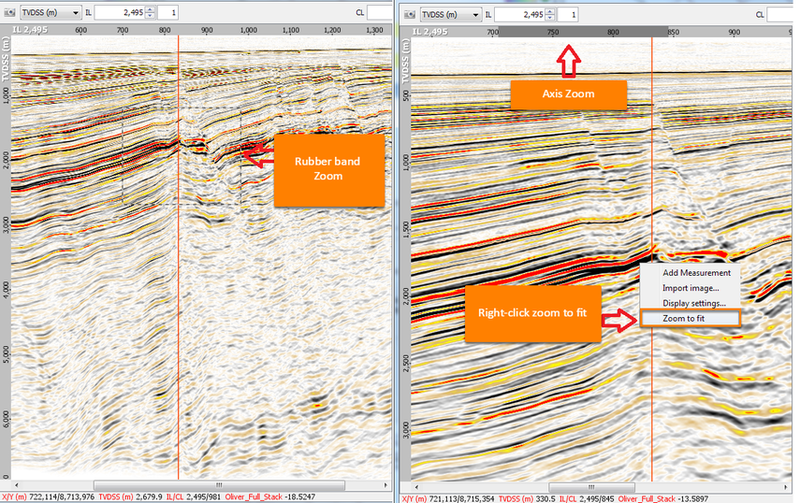 Visible extent of any section view (IL/CL, 2D line, etc) is shown as a thicker zoom line in the Map View. The zoom line can be moved in the Map View which will update the section view.